With just 6 weeks left to run until we stage our 2018 Mass Build event at the Great Orme 9th September, I'm conscious there are some models completed or fast approaching completion already - whilst others still have some significant work to do!! 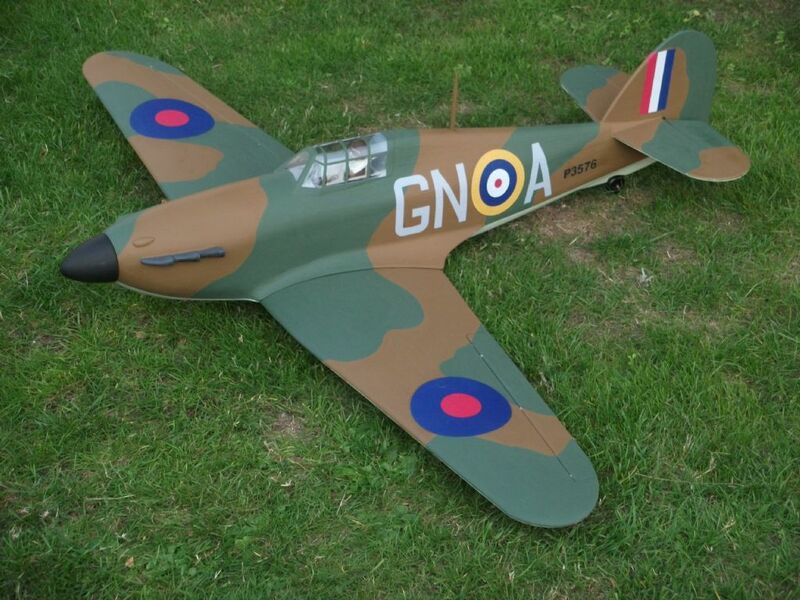 A place to post a photo or two of your finished Hawker Hurricane! 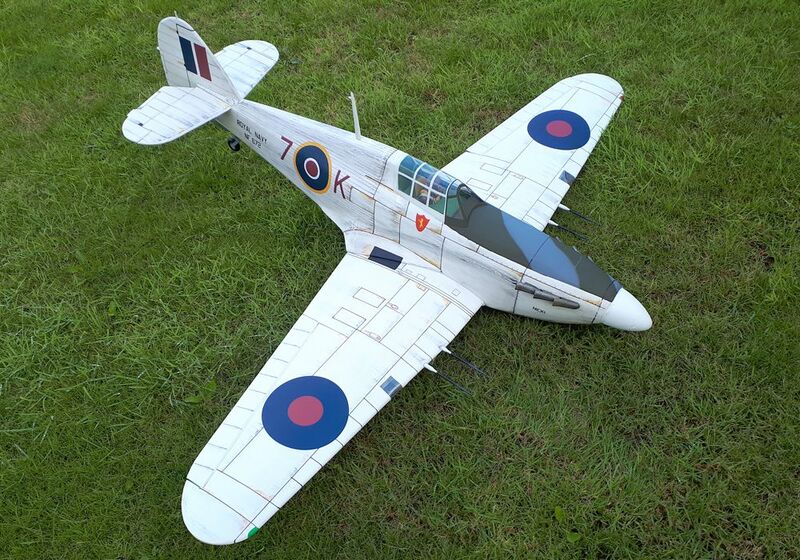 Please keep the posts brief - add a little description of the model, maybe describing the chosen subject, the type of finish, achieved AUW, R/C channels and any special features etc. 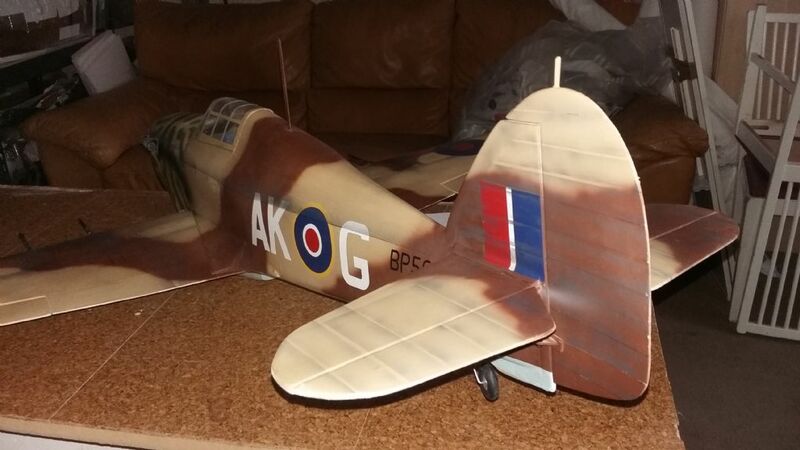 I'll make a start by adding a photo of the prototype model built and now finished ready for the event by Matt Jones. 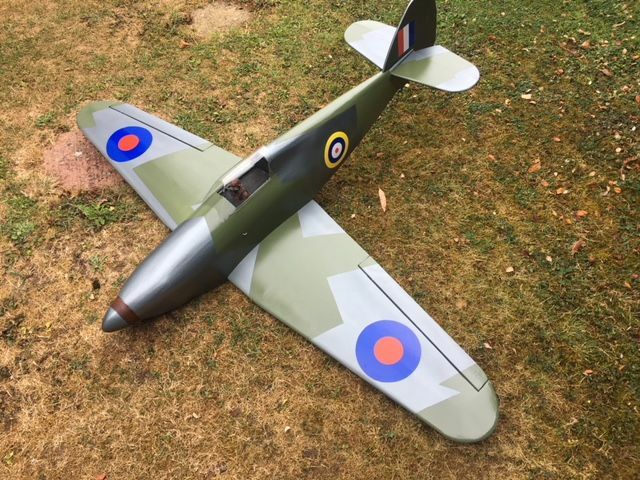 The model is finished as P3069 - An early Mk1 example from 303 Sqn based at RAF Northolt in September 1940. The model is painted using airbrushed enamels over the original silver Solarfilm which was Prymol etched. The pilot and exhaust stubs are made by Real Model Pilots (1/9th scale) and the decals are from Pyramid Models. The models AUW has increased a little with these additions towards 3lb. Just exhaust to add colour scheme 1940 experimental camflouge finished in oratex and spray painted finished AUW is 4Lb. 1 Oz abit on the heavy side but should be ok had to add 1Lb 1Oz of lesd. Here ya go - now finished and weighed this am at 1093gm or 37.3oz - can't be right but there you go. Did check it twice and the scales. 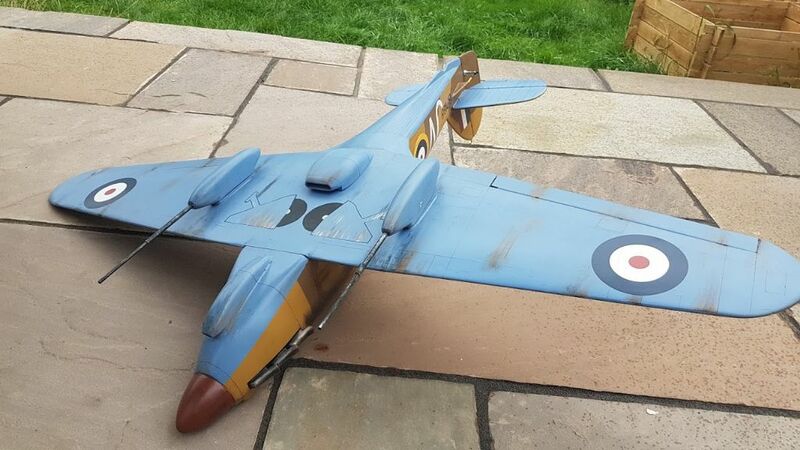 Oh yes it was finished in 25gram fibreglass cloth, Ezekot water based resin, then white undercoat and Tamiya rattle cans and airbrush - light sand, nato brown, and Luftwaffe light blue. Special feature - air cooler at the front and detachable magnetised guns on pieces of elastic. And a lorra lead in the spinner. Sorry chaps just to dispel rumours that I can't weigh anything accurately, I have now weighed the Hurricane again accurately and the correct weight is 50.3 oz or 4lb 2oz That is more like it. 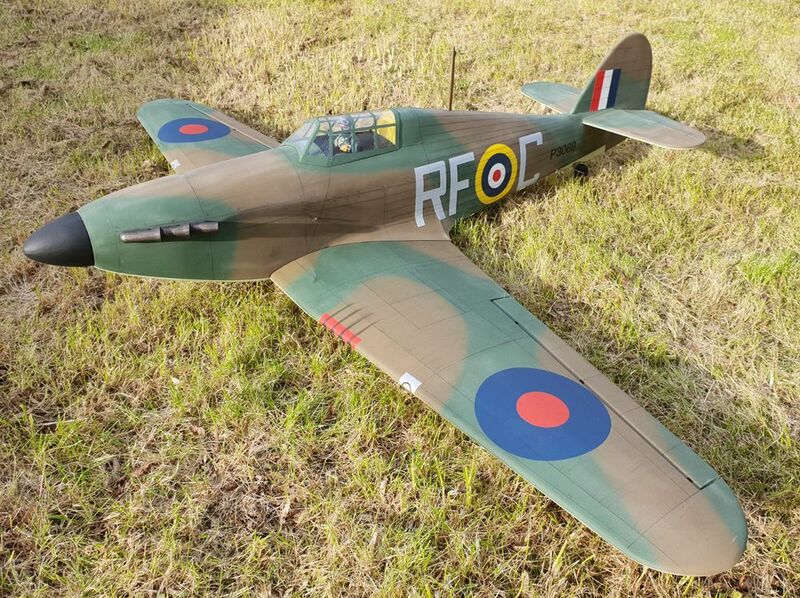 So what does that make the wing loading please someone with a bit of gumption because I just couldn't work out the surface area of an eliptical wing? Also forgot to mention that the decals came from Tim at Modelmarkings.com Thanks Tim. 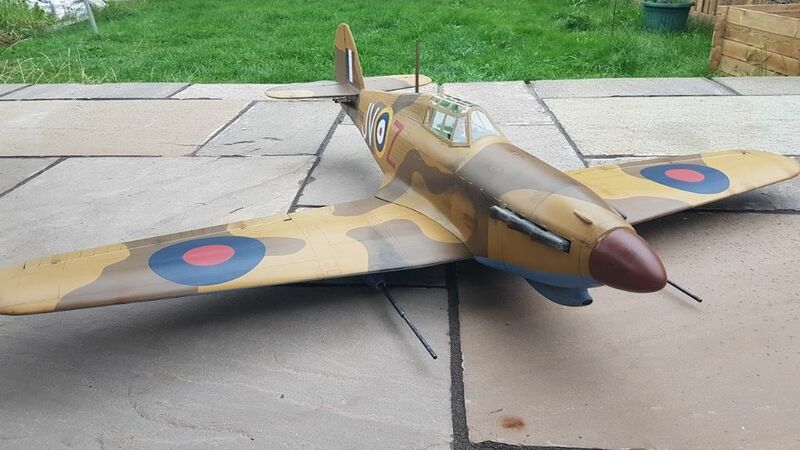 I thought I'd finished my Hurricane but just discovered I haven't glued the aileron hinges in either the wing or the ailerons! I'll have to juggle WD40 on the pivots whilst carefully dropping superglue in the right places. My ready to fly weight is 1.56kg, that's 55oz in the old money or 3lb 7oz, . 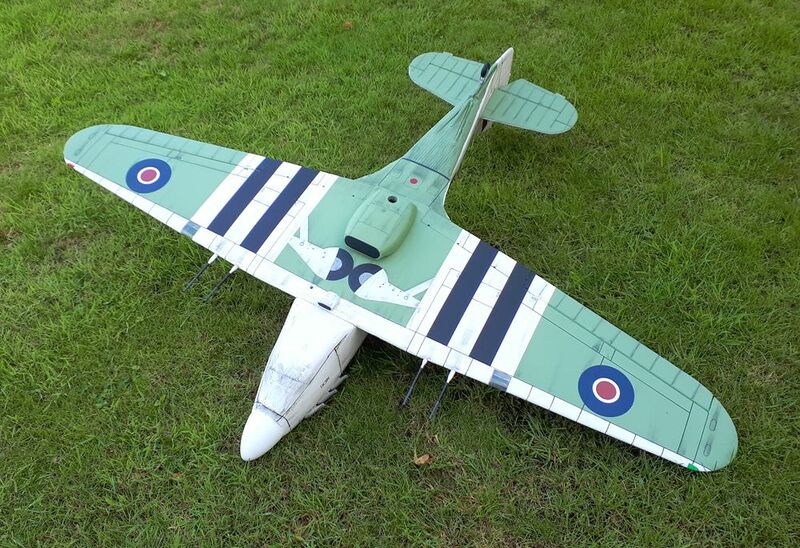 I reckon that landings are going to be fun - as soon as the radiator touches down all the extra lead fitted in the battery box will cause the air-frame to roll forward and to do a nose stand! 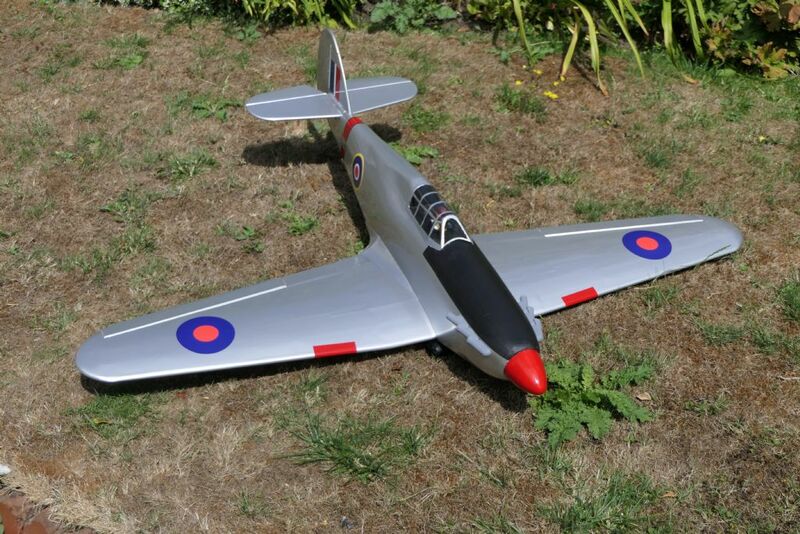 I think it best to postpone my maiden flight till the Great Orme event in September. 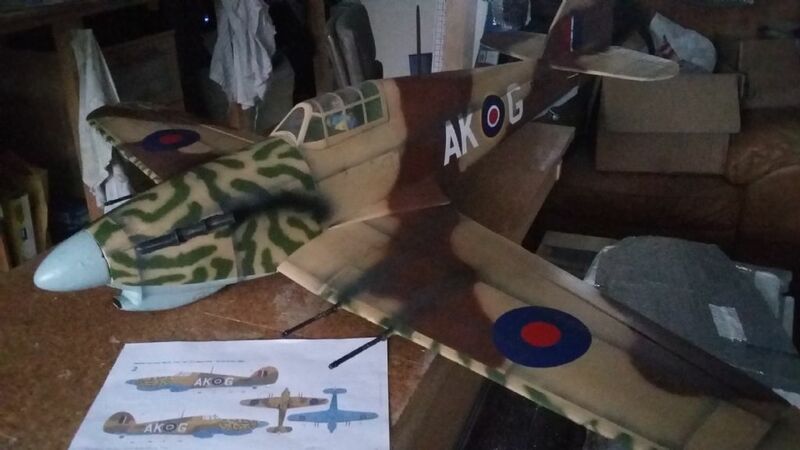 Posting here on behalf of Steve Kemp, who has just finished his Hawker Sea Hurricane IIc. 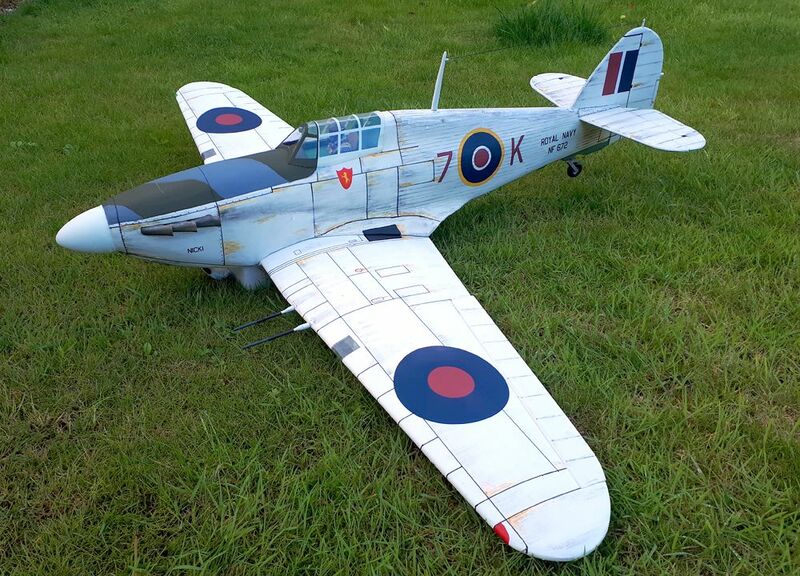 Steve's model is finished to represent NF672 'Nicki' from 835 Sqn FAA operating from HMS Nairama in 1944. The model is finished in Solarfilm, etched then painted in acrylic and enamel paints. 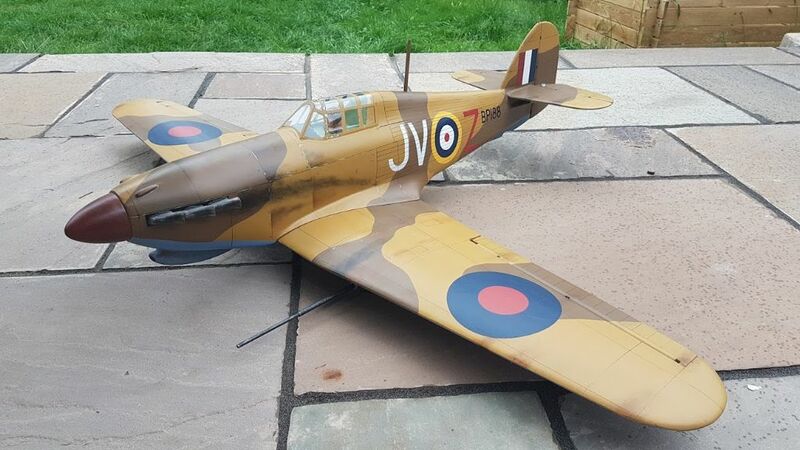 Steve has used decals from Callie Graphics and the weathering is applied using charcoal pencil dust under a coat of clear lacquer. Exhaust stacks are 3D printed by Andy Meade. AUW is reported as 3lb 13oz. Great job Steve she looks superb!! Some good looking Hurricanes so far! Can somebody please confirm what the C.G. for the Hurricane is? If I balance at 70mm from L.E. my model is weighing in around 5lb. The C.G. is definitely 70mm from the L.E. with models averaging 4lbs, do you know why yours is a pound over? Actually it's not really completed - I still need to connect some linkages and balance it - but this is how it will look next weekend. 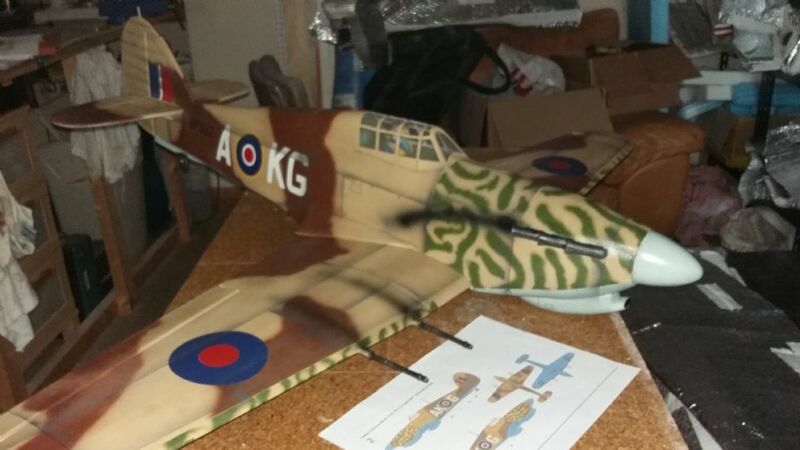 It's very basic - no lights, no cannons, no scale details, but it's almost finished and ready to fly, if we get some wind! Looks lovely that Steve - and snuck in from nowhere too - out of the sun!! Stick a fork in it - she's done! Well...almost. Just the tail wheel to mount and the aerial wire to string. Near enough. Not the best light this morning as it just started raining. 4lb 6oz AUW. Great looking Hurricane - another one reaches the finish line!! We should see a number arriving on here this week on the final run up to the event - who will be next!?!? Nice Andy - I will put my money on those guns lasting one flight. 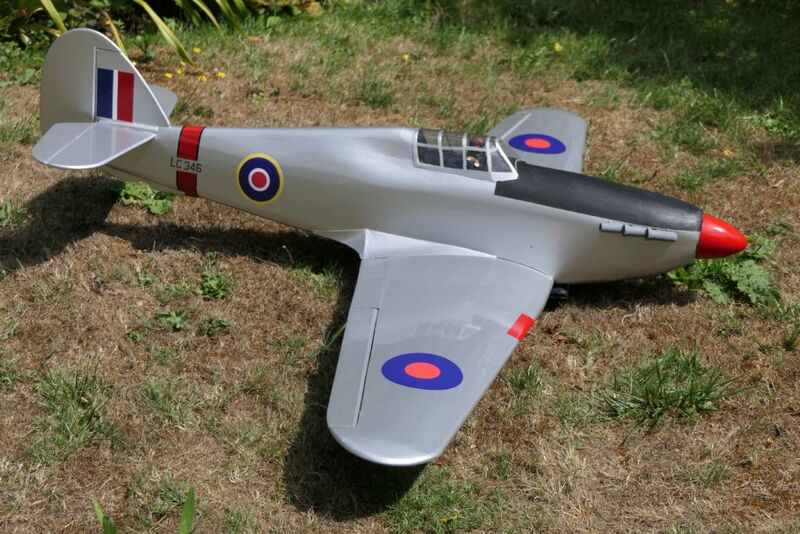 All mine except 1 came off mid flight, and I am making some more for static display only. Same weight as mine. Flies like a dream if you use Matt's suggested settings. Next time try free hand airbrushing. Saves a lot of time and masking.